Recently I purchased a blank from Creative Dimensions, which is a dual coolaboration between two members here on IAP, Charlie (NewLondon88) and Alton (GreenMtnGuy). I purchased my blank from www.exoticblanks.com. After completing that blank I was given the opportunity to do another one and write a review on it, here is that review. 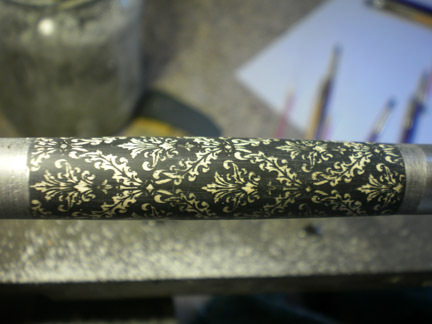 I decided I wanted something to bring out the details of the blank so I figured a black paint was a place to start. I brushed this on and then wiped away most of it and let it dry for about an hour. After letting dry, I lightly sanded back to the wood on the raised parts of the blank. Here is where I thouroughly checked the detailed part of the blank to make sure I was happy with the painting. Then I applied CA to the entire blank. I believe it was 3 coats of Med CA until the blank was smooth and all the low spots were filled in. Next I sanded the blank back down again to show the wood on the raised areas. I thought the blank was good before, but I wanted to show how I would go about adding another color. It was a way that was mentioned in one of the other threads so I figured it was what I would try to see how it worked. 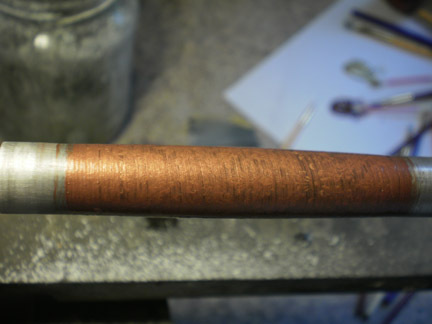 I applied a copper color and repainted the entire blank. I let this dry for about 30 minutes or so. I then used warm water to clean the excess paint off. The copper color turned more of a yellowish/gold color but overall I was happy with the results. 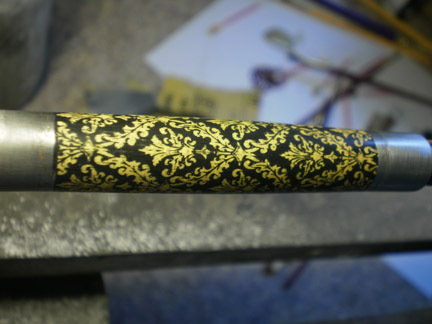 I finished the pen by adding 6 coats of thin CA. Then MM to 12000 and plastic polished. 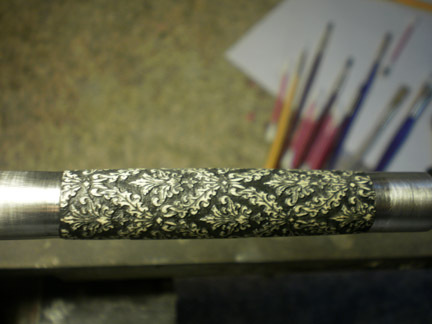 Heres the finished pen and a final thought. I think these blanks open the door for many possibilites and different techniqes to be applied. I will be doing more in the future and attempting different techniques. I believe Charlie and Alton have came up with quite a unique blank that is only limited by your imagination. I would definately purchase and deal with Charlie and Alton again. Last edited by Phunky_2003; 04-04-2010 at 12:38 PM. Beautiful! Amazing how layering colors makes such a difference in the richness of the pen. Thanks for the step-by-step pictures. Do you have a photo of the finished pen on a plain background? 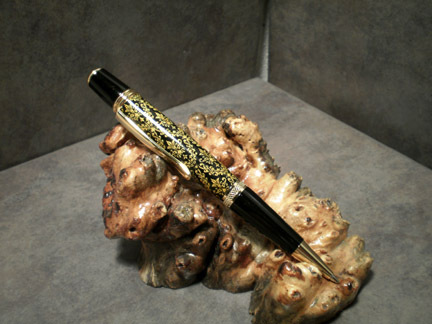 The burl is pretty, but has a bit too much figure that overshadows the pen. Excellent! The colors might not have worked as well as one might hope for, but you definitely got that pattern to "pop." I like the idea of these blanks. 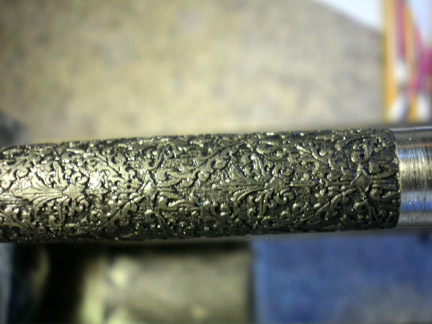 Intricate patterns are a gold standard of appearance, but I have not yet been really impressed with the results others have posted. I, too, have been thinking about how to approach these blanks. The laser cuts a deep, sharp pattern and taking advantage of the difference in the raised area is obviously the key. But how? Wow. What a beautiful pen. Thanks for sharing the steps involved. I was on their site this morning and was very impressed with their selection. I think there is a perception that these blanks are somewhat difficult to produce. What is your level of pen turning ability and how would you rate the level of difficulty of these blanks? 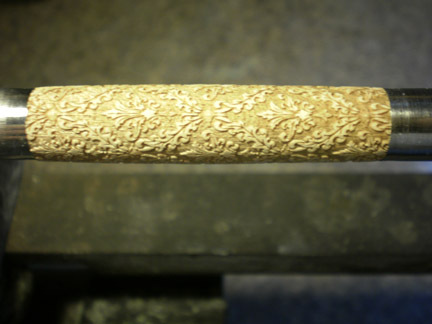 Looking for an objective view of the ability of the average pen turner to produce these blanks. it looks very nice, but I think you probably sealed the wood when you added the CA thus preventing the copper from penetrating or adhering to the raised areas. I've been thinking about ordering one of these to try out an idea, but I'm not sure the idea is fully formed. I really appreciate the photo mini-tutorial. I'd say my level as a pen turner is beginner to intermediate. I have been turning for almost a year. I am still learning with every pen and finish. At painting and finishing I am an amateur at best. It is difficult to put an exact difficulty level on these. They can vary from very easy to difficult, depending on what each person wants to do with the blanks. You can simply stain and finish which would be very easy most anybody could make an outstanding blank with normal finishing techniques. I started with just a CA finish so it could be seen that most could order a blank and not have to invest in a bunch of other supplies to finish one. 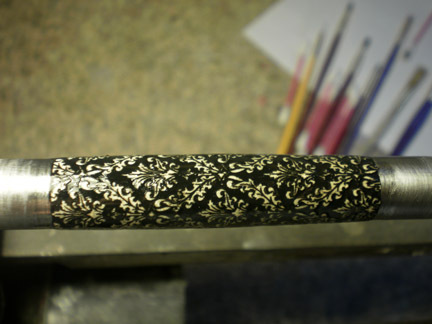 You could also be very tedious and hand paint each section making it much more difficult. I think the difficulty level will be determined by the person completing the blank. Doing what I did, I would say that was a beginner level. I wrote this up and added some basic pictures to it. I will be taking some pictures with a phototent probably tomorrow I will add one then. Thanks for the opinion on the picture. I thought the same thing about the CA preventing a good penetration or adhering to the raised areas. I also tried that brand of paint on another piece of wood, and wiping it away did the same without ca. So I am not sure if the paint was a good choice. I have seen some gold/copper/silver paint pens that may have worked better for this that I will try out soon. They may make it easier to do other techniques with also. I never thought sanding back a CA finish to use as a mask.